The third in my series of d100 random encounter tables by terrain type for the Furthest Lands continent, this time swamps and marshlands. Plains/grasslands, and forest/jungle were the other two, and there are at least seven (not counting the *Special* table) more in various stages of completion. Ideally I would've spaced out swamp and jungle more, but I needed to get the swamp list finished to head off some players. 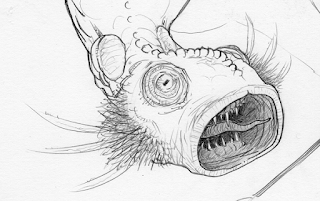 01-02 Giant Salt-Fen Spitter – a thirty foot amphibious worm that sprays acid and corrosive enzymes from its bulb-like head. 03-04 Catoblepas – the body of an emaciated water buffalo, the lumpen head of a warthog on a shaggy giraffe neck. The catoblepas kills any creature that meets its eyes, and poisons the area around it. All the food it eats is rotten and ruined, and it remains hungry at all times. Some enjoy submerging their bodies in deep water, letting their massive heads float on the surface, found this way they are incredibly dangerous. Milk and live animals are quite valuable. It is said that if a catoblepas could be fed from an early age food that wouldn't rot, it would mature into a beast of another nature. 05-06 Quicksand/Sinkhole – suffocating quicksand or a random sinkhole appears beneath party and/or in direction of movement. 07-08 Tanystropheus – crocodile-sized, low-bodied reptiles with long stiff necks. Fish and bird eaters, will attack a person only territorially, in self-defense, or desperation. 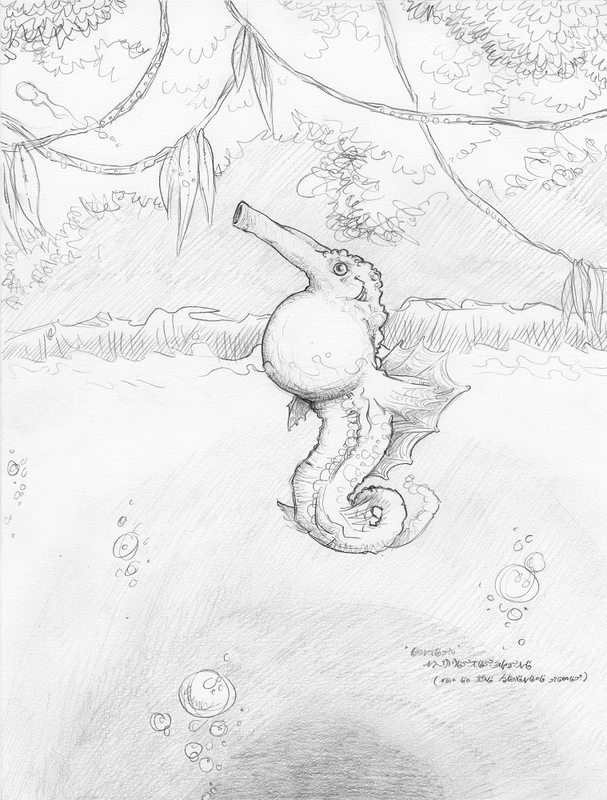 09-10 Marsh Squirterhorse Family – well camouflaged dog-sized seahorse-like fish, uses their blowgun snouts in the manner of a deadly archerfish. Fires a spray of acid and enzymes that slowly consume metal, quickly consume organic material, and has no effect on stone. 13-14 Giant Mosquito Swarm – massive man-sized mosquitoes, capable of completely draining a person of blood in minutes. Many carry horrible blood-borne diseases, and the victims of others return from the dead as withered zombies. 15-16 Swamp Zombie Herd – the putrid flesh of many swamp zombies carries a great threat of disease and infection, may be submerged and attack waders, or be surrounded by a nauseating stench. 17-18 Choke-creeper - strangling vine monster. 19-20 Bronzebeak Fisher - giant kingfisher bird with a metallic beak, huge, aggressive and territorial. Attacks characters wearing shining objects (armor, jewellery, iridescent fabric) who it confuses for fish. 21-22 Giant Vicemouth Turtle – massive, car-sized snapping turtle, swallows prey whole or severs limbs. 23-24 Marsh Rats - oddly intelligent, tool-using, plan-making rodents of unusual size. 27-28 Swamp Filth – a collective term for various oozes and jellies of the marshlands. 29-30 Electric Eel – a normal or a giant electric eel, giants can discharge two or three times as often as normal eels, both are highly valuable captured alive. 31-32 Fenflies – giant biting flies, some leave stinging lightly poisoned wounds (weakness, pain), some leave diseases, some insert eggs into wounds. 33-34 Lanternhulk – a bag-like creature, like a great toothless mouth, large as a room, its slug-like foot an anchor buried beneath the surface. Draped in plants, filth, and natural illusions it can resemble a cave if it wishes to hunt during the day. At night the Lanternhulk earns its name, displaying various forms of bioluminescence, lights within its mouth, lights on mobile tendrils, as well as floating biomagical light effects. Prey that enters the creature's mouth is enfolded, sometimes suffocated, sometimes drugged, eventually dissolved. 35-36 Bear-frog – a head and powerful forelimbs reminiscent of a bear, partly furred, with the elongated leaping back legs of a frog. Unlike the famous Owlbear, the Bear-frog is a “natural” animal, though it shares the Owlbear's preference for attacking magic-users. 37-38 Koolasuchus – massive, spade-headed amphibious salamander, can swallow M-sized prey whole. 39-41 Otyugh (single/pair) – the Wretched Sages, the repulsive and often murderously hungry otyughs are common in the swamps, where they dine on and bathe in decaying matter. Because they are in constant telepathic communication with every being they encounter, and despite their poor intelligence, they are sought out occasionally for the wisdom of fools. Otyughs in pairs are engaged in philosophical argument and are eager for outside input... or a quick snack. 44-46 Snake (1d4) – as usual, every snake is intelligent and able to speak. Venomous and constrictor snakes love hostage situations and making deals, spitting snakes often work in concert with other creatures, intelligent or otherwise. 4. Elder Serpent - giant, venomous, highly intelligent, wizard or cleric spells. 47-48 Giant Sundew – a massive deadly sundew plant, slightly mobile, vaguely aware. Positions itself at choke points, waterlines, feeding and nesting grounds. The peculiar odor of its digestion attracts oozes. 49-50 Brown Pudding – this gelatinous creature will consume any organic material, but vastly prefers larger living prey, for this reason they are often encountered semi-dormant in “pudding pits”, their orifices concentrating downward, slowly dissolving the decaying matter beneath them, but will form up and become mobile after a round or two. 51-53 Naga - the “oldest masters”, they are selfish, secretive, and suspicious. They can be civilized folk, cold-blooded killers, slave takers, or enigmatic guardians, depending on the day. The Naga have their own small city-temples, but they are not fond of each other's company. 54-55 Dark Banyan – a strangled treant, completely dominated by the parasitic magical fig vine that took epiphytic root in its body. A wooden tentacled mass capable of cruel nature magics, and the control of other ill-willed vegetable creatures (Ollgrad, Boskbeasts in particular). 58 Vampiric Moss – inanimate hanging moss that drains the lifeforce of a nearby creature after establishing a link, consumes a set amount of hp, and loses link when victim leaves its 30' area of effect. 59-60 Giant Water Beetle – an eight foot predatory water (diving) beetle, ambushes prey at the water's surface, or attacks underwater. May create a “pen” of trapped air to preserve live creatures underwater. 61-62 MutantTroll Pack - slightly undersized trolls that mutate as they regenerate. Amphibious, regenerate slightly faster than those of other terrain. During regeneration of massive damage they can fuse together into larger abominations or break into smaller, independent, ruined parts. 63-64 Ollgrad - small, bloodthirsty (literally) root people. 65-66 Giant Leech – three to ten foot long leeches, potentially deadly, more difficult to remove, and much more likely to transmit a blood born disease than normal leeches. 1. 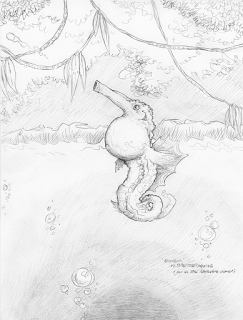 Phlebeth - like a Kappa, keeps its mouth full of water to remain strong on land. Can adopt the shape of a person, but is always wet and silent. 3. Mucugulob – this spirit attaches itself to a creature transforming it to a locus of disease and decay, slowly kills host who eventually becomes a powerful cursed undead, infects others with rotting and wasting illnesses. Appears to host initially as an almost pokemon-like stylized semi-real animal. 69 Mud Dragon – fat-bodied amphibious dragons, wingless and scaleless, with weak tiny eyes and round, toothless jaws, a dragon that looks like a catfish and a salamander. Mud dragons are slow and stubborn, they spend much of their time asleep buried beneath mulch and silt and clay and brackish water, slowly eating, chewing, and digesting vast mouthfuls of earth, and rendering it into thick gooey mud. The thick mud is the dragon's “breath weapon”, victims of failed saves are mostly/completely buried in mud, others in area slimed, additional 'stinking cloud' effect. 70-71 Boskbeast (Shambling Mound) - animate heap of rotting vegetative matter, always hungry for intelligent beings. 1. Flammable/Explosive – area of party movement contains an invisible gas that will explode on contact with open flame. 2. Inebriating – area of party movement contains an invisible drug-like gas of various effects. 3. Deadly – area of party movement contains a deadly gas that has at least one noticeable sign. 4. Nauseating – area of party movement contains a gas with a nauseating stench, as per 'stinking cloud'. 74-75 Skunk Ape – bigfoot, sasquatch, yowie, yeti, a large hairy humanoid of tremendous strength, adept at traversing the marshes undetected. Some accounts portray this “swamp man” as a malicious, territorial beast, others as a gentle hermit. 76-77 Muckdweller – take the 2nd ed. 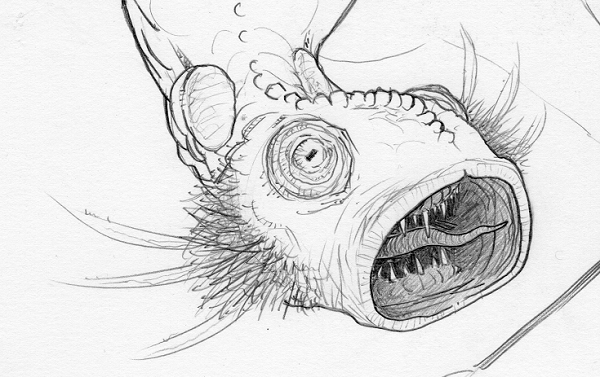 MM entry as truth, but they look like mudskipper fish, done. 1. Bloodmask Frog - red face, black or yellow body, neurotoxic and quickly fatal. 2. Moon Frog - light blue and white, causes intense hallucinations for 3d6 hours. 3. Opal Frog - darkly iridescent skin, vomiting and diarrhea for 1d6 days. 4. Vrian's Peeper - light green body with orange head, very small, paralysis for 1d20 hours. 5. Firefrog - yellow, orange, red and purple, severe itching rash for 1d4 weeks. 6. Mist Frog - purple to dark blue, anesthetic numbs random body part. 80-81 Giant/Huge/Colossal Centipede - suitable venomous centipede encounter. 82-83 Sonihadrosaur (pair/herd) - mid-sized (for hadrosaurs) duck-billed dinosaurs with an elaborate fluted crest on their heads. Adults inflate their resonating crests to release a Sonic Honk in a 100' cone every few rounds. Fiercely protective of non-sonic young and nesting sites. Can be subdued by "banding” the crest, binding it with a leather belt or metal band. 84-85 Cleaverclaw Crab – a giant marsh crab, big as a one-family hut, males have one tremendous limb-severing claw. Another animal attracted to the glints of metal, glass and other fine materials that it tears to shreds in front of its lair, hoping to attract the attention of bauble-draped females, who have two smaller claws, just as sharp. 86 Swamp (Green) Hag – not a woman, not 'iele', misshapen and deranged, less evil and more dangerously other, a hag is more npc than monster, but more spirit than mortal. There may be a hag for every swamp, a swamp for every hag. Each one is completely different from the next, still they claim sorority with every other. 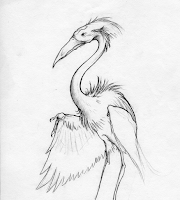 87-88 Cloak Stalker – a huge bird, resembling in general form a great crane, twice the size of , its plumage many difficult to discern dark colors, its wings are covered in overlong feathers that it holds loosely around its body like a cloak, its bright and tiny eyes purple and orange. The stalker may follow its prey through the marshes for weeks, waiting for a perfect time to strike, it is highly intelligent and possessed of old magics of illusion, obfuscation, and trickery. 89-90 Goo Basilisk (Jellilisk) – larger than a normal basilisk, The gaze of the dreaded basilisk of the swamplands turns its victim to living ooze. Try turning your friend back from that! The Jellilisk is one of the favored familiars of the greater Jellementalists, and their eyes a key ingredient in the manufacture of ioun slimes. 91-92 Swamp Crocodile – a long-limbed prehistoric crocodilian that excels in the broken, varied terrain of the marshes, equally at home darting through murky water as running and leaping across the mud and roots. 1. Partially submerged cave, cleared and habitable. 2. Fully submerged cave, inhabited. 3. Swamp structure (fungus, raised hut, tree), uninhabited. 4. Lair of nesting creature. 95 Giant Dragonfly – M or L size giant prehistoric dragonflies, glittering, rapid, and quiet, large species attempt to fly away with a victim, others attempt to amputate body parts and escape. 96 Giant Dragonfly Nymph – predatory aquatic larva of the giant dragonfly. 97 Shriekers - the classic alarm sounding, random encounter attracting, oversized fungus. There are over a dozen species, each with a distinct morphology, so they may look like: giant puff balls, tall thin mushrooms, brightly colored tree growths, etc. 98 Piranha School – comically voracious school of piranha fish, able to give extended chase, chew through inedible objects, and skeletonize a person in under a minute. 99 Peat Mummy – mummified exile or criminal buried in the swamp ages ago, an undead creature with shiny, dark, leather-like skin, and a rigor-racked wasted frame, strong and fast but awkward, it wants blood and breath and whichever organs you keep your soul in.